Having interviewed illustrator and graphic designer Michelle Mason for the blog earlier this year, I was super excited to hear about Michelle’s latest venture, a shop on the wonderful Columbia Road in East London. Launched with furniture specialist Tim Painter, the pair have worked tirelessly all summer sourcing a diverse range of products and curiosities for their ’emporium’ which opened its doors at the start of November. Home to the famous Sunday flower market, Columbia Road has in recent times become a thriving hub of independent interiors, vintage and design stores, open at weekends only. It gets incredibly busy on Sundays (when the flower market is open until 2pm) but it is a fab buzzy atmosphere and a true London experience, not to be missed! British homewares designer Michelle, known for her collections for House of Fraser, Heals, London Transport Museum and Woven Ground, has created new products for the launch as well selling her established designs including the Stella felt rugs and signature London Bus Blind wallpaper. Tim has created upcycled furniture and brought an eclectic mix of exciting, one-off vintage finds. I was lucky enough to go to the store prior to its opening night to do some styling and interviewed Michelle while I was there. How would you describe your new shop and what type of of product do you sell? We sell quality, UK made homewares and vintage furniture with quirkiness and functionality. Everything is hand picked by our shared vision of creating a traditional store with a timeless feel. Everything is for sale – even the solid oak workbench currently used as the shopʼs counter! 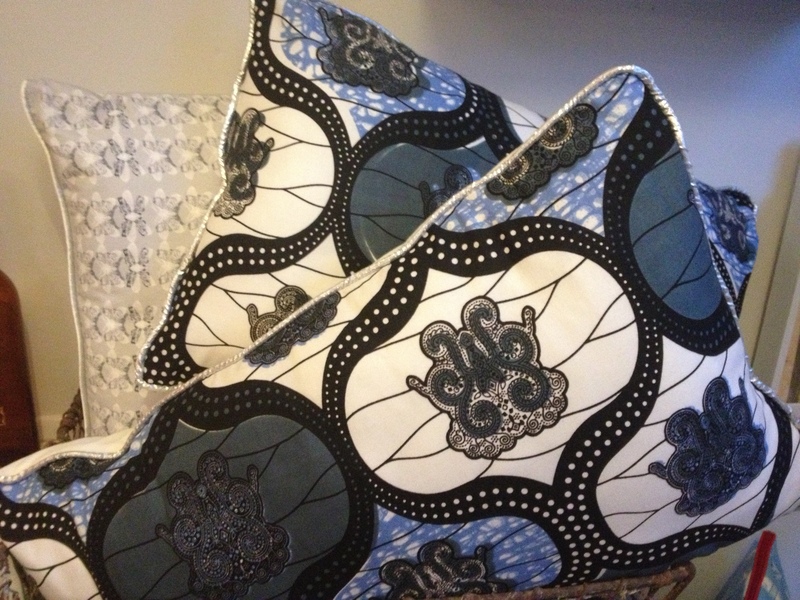 We have cushions made from reclaimed seed sacks and vintage glassware which sit alongside contemporary lambs wool throws and bone china teapots – a real eclectic mix! Where do you find your stock? 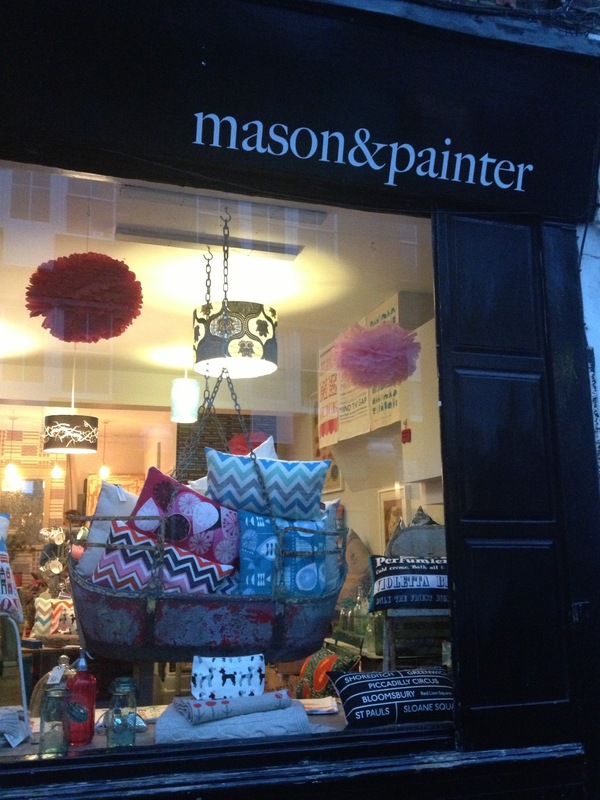 We stock established and emerging designer / makers, many of whom are local. We have some lovely ceramics from Chloe Owens and Rebecca Chitty and lambswool blankets from Sally Nencini. 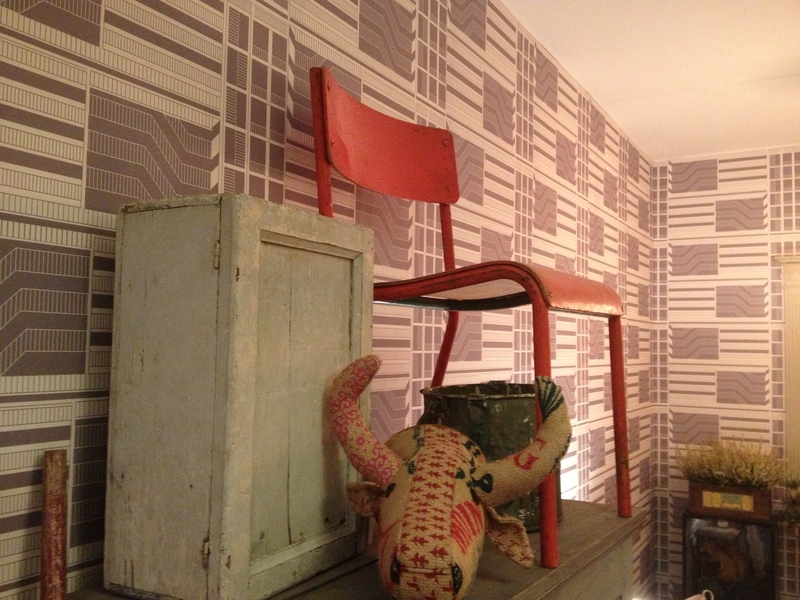 We also stock my new wallpaper and linen cushions and this is mixed in with vintage accessories and furniture. We’ve bought vintage pieces from both the UK and France, having done a road trip through France stopping off at flea markets along the way. What sort of prices can customers expect to pay for pieces in the shop? Prices range from £2.50 for Letterpress greetings cards and paper pom-poms to £800 for a 1920s boat swing from a French fairground so it is safe to say there is something for people on all budgets. We also have a number of £10 to £15 pieces including tea towels, oven gloves and bone china mugs plus cushions and lampshades priced between £25 and £65. What’s you’re favourite item that’s currently in your shop? I particularly like the 1920s boat swing from a French fairground, currently hanging in the window full of cushions. Your own work is sold in the shop… do you have any plans for new collections or collaborations in the pipeline? I have a new range of kitchenware products launching at House of Fraser in February for Spring Summer 2014 which I’m really excited about. The collection has a lovely summery feel with strong primary colours and the range includes chopping boards, storage jars with cute wooden lids, mugs, aprons, tea towels and oven gloves. And I’m currently designing a new range of wallpaper with a botanical feel for my own collection, also to be released next Spring. How long has it taken to launch since you decided to open a shop? We got the go ahead at the end of June and it took most of October to decorate and re-fit. Farrow and Ball we’re fantastic – they supplied all the paint, including the gorgeous Stiffkey Blue from their new range. What advice would you give to someone that would like to open a gift / homewares store? Be prepared for really hard work but lots of fun. What’s the next step in the life of the shop? We’ve only been open two weeks so we will have to see but it would be amazing to open a second store further down the line – perhaps outside London.